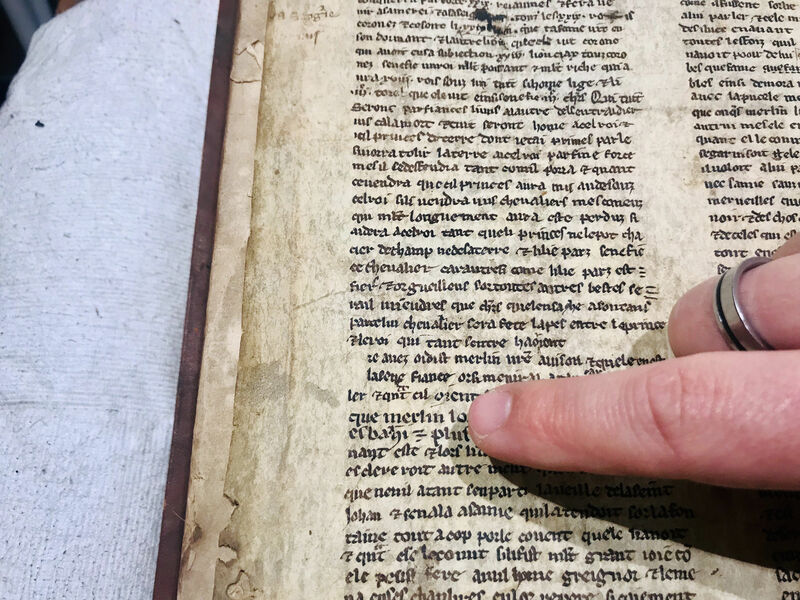 Fragments of a 13th century Old French text of Arthurian legends have been found inside a series of later bound books in the Bristol Central Library. 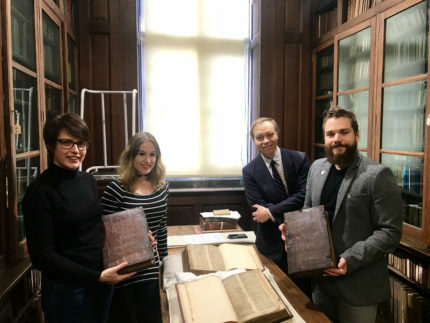 Seven handwritten manuscript fragments from the Vulgate Cycle, also known as the Lancelot-Grail Cycle, were discovered by the University of Bristol’s Special Collections Librarian Michael Richardson while perusing a collection of the works of 15th century French scholar Jean Gerson. The four-volume edition of Gerson’s works was printed in Strasbourg between 1494 and 1502, but it seems they were not bound because the first binding appears to have been done in England in the early 16th century. That’s when the fragments of the Old French manuscript became integrated into the books. Parchment was expensive and bookbinders often reused old “waste materials” in their bindings instead of using clean sheets. There is evidence on the leaves that at this time they were pasted on the front and back boards of the books. 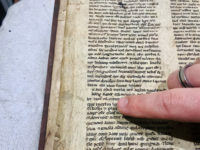 When the books were rebound at a later date, the pasted fragments were unglued from the boards and used as flyleaves (those blank pages you still find today at the beginning and end of a volume). Richardson recognized the names of key figures, most notably Merlin, from the Arthurian tales on the oft-recycled parchment pieces. 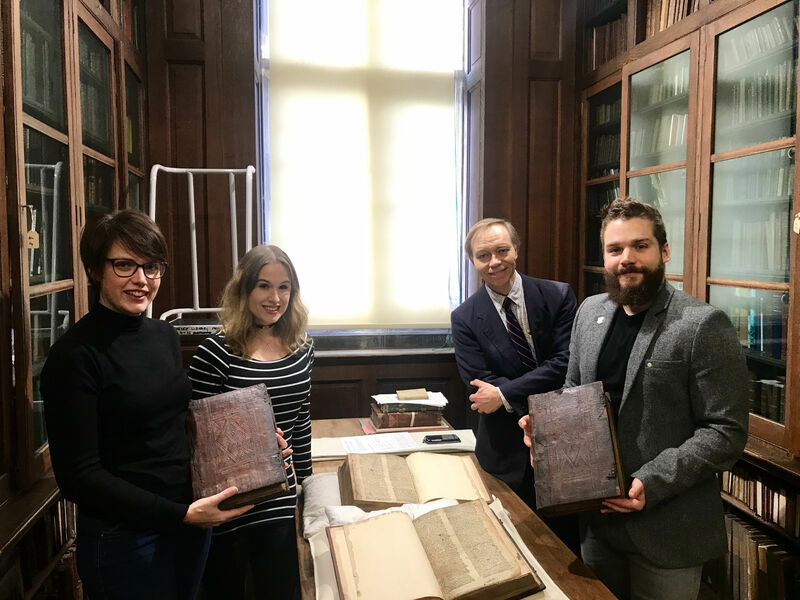 He called in Dr. Leah Tether, an Arthurian expert from the University of Bristol’s English department to assess the significance of those names and manuscript fragments. She identified them as pieces of the Vulgate Cycle, a telling of the Arthur legend that predates all English-language versions and is thought to have been Sir Thomas Malory’s source for Le Morte D’Arthur. There are other surviving examples of the text, these fragments have intriguing differences in the narrative. The seven leaves represent a continuous sequence of the Estoire de Merlin narrative (though they are bound ‘out of chronological order’ in their current form) – specifically in a section known as the ‘Suite Vulgate de Merlin’ (Vulgate Continuation of Merlin). In the newly discovered fragments, there tend to be longer, more detailed descriptions of the actions of various characters in certain sections – particularly in relation to battle action. Sometimes only small details are changed – for example, King Claudas is wounded through the thighs in the known version, where in the fragments the nature of the wound is left unsaid, which may lead to different interpretations of the text owing to thigh wounds often being used as metaphors for impotence or castration. The damage to the fragments from their use in two different bindings will make it challenging to fully decipher the text. Researchers will use infrared imaging, if necessary, to read through the damage and publish a full transcript of the exciting new finds. This entry was posted on Thursday, January 31st, 2019 at 11:08 PM	and is filed under Medieval, Modern(ish). You can follow any responses to this entry through the RSS 2.0 feed. You can skip to the end and leave a response. Pinging is currently not allowed. So, if these books were originally bound locally, other books using the same bookbinding materials could also be around somewhere local – or be destroyed or now elsewhere on the planet, of course. Did one of more historical figures exist on whom the Arthur yarns are based? Maybe. So Arthur lies on the spectrum between Moses (didn’t exist, nor anyone like him) and Mahomet (somebody, or somebodies, like him existed). Also on this spectrum lie Jesus (probably existed, and in the singular), and Alexander the Great (existed). In a hundred years time people will wonder whether such people as W, O, and Tony Blair ever existed, and will conclude that it’s pretty bloody implausible. Referring to ‘De Excidio et Conquestu Britanniae’ (Gildas ‘On the Ruin and Conquest of Britain’, ca. 520 AD), Ambrosius Aurelianus was transformed into the uncle of King Arthur, the brother of Arthur’s father Uther Pendragon. In 406, Alans, Vandals, Suevi, and possibly the Burgundians, had crossed the Rhine and invaded Roman Gaul. The Burgundians settled as foederati in the Roman province of Germania Secunda along the Middle Rhine, before they were beaten and moved to what is now ‘Burgundy’. The ‘Quadi’ are thought to have been an important part of the Suebian group who crossed the Rhine in 406. Zosimus mentions a specific tribe of Saxons, the ‘Kouadoi’, who entered the Rhineland and displaced the recently settled Salian Franks, whereupon some of the Salians began to move into the Belgian territory of Toxandria. After in 486 Clovis I. had beaten Syagrius, the last ruler of a Roman rump state in northern Gaul, another -this time Gallo-Roman ‘Aurelianus’ defected, and even became Clovis’ chief advisor. –As complicated as all of this looks, it seems as if some boats were taken for England. And You know Moses didn’t exist because ..:.. ?? (ii) The archaeology supports the conclusion. (iii) The absence of any relevant Egyptian record supports the conclusion. (iv) The history of Palestine supports the conclusion. Whoever made up the yarn and wrote it down many centuries after its purported time evidently knew far less about local history than is known today. Otherwise he wouldn’t have had his Israelites fleeing Egyptian control by walking into Egyptian territory, would he? The same problem, ignorance of local history, afflicted whoever made up the story of Joshua’s conquest. All the fundamental stuff in the OT is baloney. It’s only when Assyrians and Babylonians enter the stories is there much hope of reading about historical events. Wonder why Jesus believed in Moses….. He had been indoctrinated, presumably. And he too knew bugger all about the ancient history of Egypt and Palestine. Actually none of it really matters. We all believe what we want to believe. We have a saying in Hebrew— There is not just one truth. When we read history that has been passed by word of mouth it is important to remember that we can not definitively state that someone existed or not. With such information we never know which parts we know are true and which are untrue, and also which we do not know are true and are untrue, and how they relate. So stating something must be true because of what we know today about geography and the political states of the past cannot possibly fully match the origins of a story of which we only know the later versions. Essentially, if we cannot prove that ‘Moses’ was any particular Moses, we can also not prove that any ‘Israel’ was any particular Israel, because we do not know where or how the parts of the story met our reality. What we have is a story that X left Y to go to Z, none or all of which may or may not of happened as a single event. Dicky Dixon’s and dearieme’s comments about Arthur reminded me of the recent book by Graham Robb, THE DEBATABLE LAND, THE LOST WORLD BETWEEN SCOTLAND AND ENGLAND (ISBN 9780393285321). The author made latitude corrections to Ptolomy’s Map of Albion and Hybernia and found that many of the map’s key locations now matched known settlement locations along the Scottish-English border. Surprisingly, many of the settlements’ ancient names correspond to the names of Arthur’s later 12 battle sites mentioned in HISTORIA BRITONUM. Robb thus makes an interesting case that Arthur was active in Southern Scotland. I’m not saying that Robb is correct on this, but his argument is worthy of further study. Besides, his book is a fascinating history of this little plot of ground along the Scottish border, and well worth reading. 1. When handling irreplaceable heritage items wear gloves.